GLO President Zimmermann meets MP Andrew Leigh in Canberra to discuss the merits of openness. GLO President Zimmermann meets MP Andrew Leigh in Canberra to discuss the merits of openness. GLO President Zimmermann meets MP Andrew Leigh in Canberra to discuss the merits of openness. 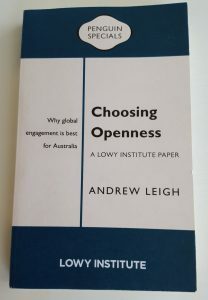 Discussion with MP Andrew Leigh on Globalism and his new book “Choosing Openness. Why global engagement is best for Australia” Penguin Books, Lowy Institute for International Policy 2017 (183 pages). On December 8, 2017, GLO President Klaus F. Zimmermann met Andrew Leigh in his office in Canberra to discuss the merits of openness for Australia and the World, and the mission of the Global Labor Organization (GLO). 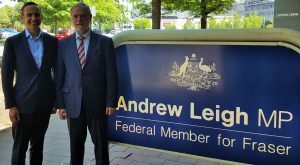 GLO Fellow Andrew Leigh is the Shadow Assistant Treasurer and Federal Member for Fenner. Prior to entering the Australian Parliament in 2010, he was a Professor of Economics at the Australian National University (ANU) in Canberra. Andrew Leigh holds a PhD from Harvard University and is a Fellow of the Australian Academy of Social Sciences. As Leigh and Zimmermann agree, global engagement has become a major political fault line around the world, where some argue that trade, investment and migration are threats rather than opportunities. The challenges to an open world are generated by global uncertainty, rising inequality and populism. In his book, Andrew Leigh argues that Australia’s past prosperity has been the result of engaging with the world, a view that complements the evaluation of global economic progress by the GLO President, and is in line with the GLO mission. Not less, but more openness is required in the future for capital, goods, and people to stabilize and foster prosperity. The two men after the discussion in front of the office of Andrew Leigh (left).